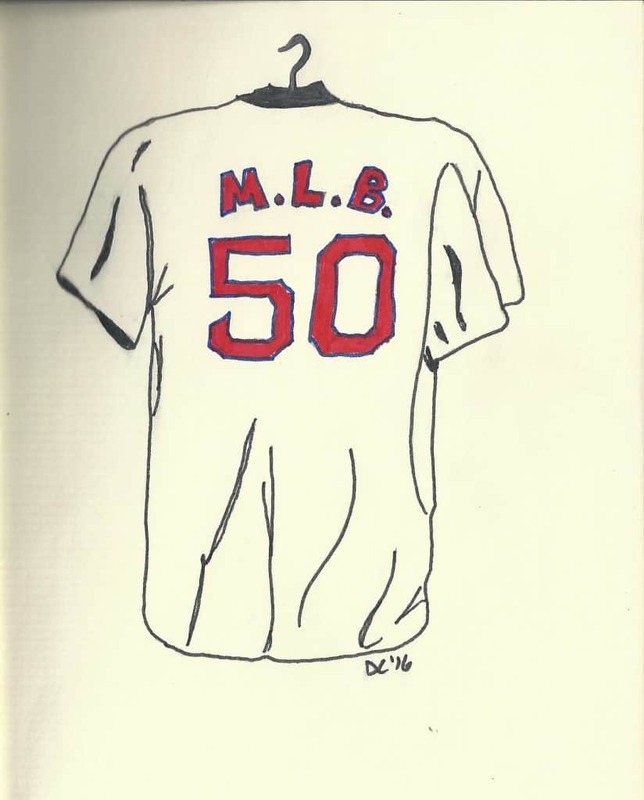 Myrl Brown: Baseball’s first M.L.B. You never know what will bring you to uncover the name of a long-forgotten ballplayer. A feat here, a tidbit there, and all of a sudden, you’re reading about an obscure pitcher who appeared in just seven games, all before Yankee Stadium was built, and who died before Cal Ripken Jr. made his Major League debut. And that’s how Mookie Betts led me to Myrl Brown. It’s not even a long and circuitous story — you might even be able to guess merely by looking at their names. But they have something in common that led me to discover Brown’s name and the exclusive club to which both players belong. And once I unearthed this unusual — indeed, unique, in baseball history — name, I wanted to know more. While he may be the first player “named” after MLB (he almost certainly was not purposely given those initials), he was, to be sure, not the first player with those initials to reach the Major Leagues. Some scouring of Baseball-Reference’s list of players whose surnames begin with the letter B and listed first names start with L or M (to account for those going by a middle name — like George Thomas Seaver or Lynn Nolan Ryan) turned up six players who came before young Master Betts. By now, you may have figured it out: Myrl Lincoln Brown was, as best I can tell, the first player in either of the major leagues with the initials “MLB.” And he’s the only Major Leaguer ever named Myrl. And Mookie Betts. Matt Beech just missed — his birth name is Lucas Matthew Beech; had his parents swapped his first and middle names, we’d have eight MLB players in MLB history. But a quick glance at Myrl Brown’s Baseball-Reference page had me wanting to know more. He pitched in seven games in 1922, starting five, going the distance twice, and winning three of them. His peripherals aren’t great — 5.97 ERA, 1.59 WHIP and 4.36 FIP in his 34 2/3 innings — but his minor league numbers show some promise: 129 wins across nine seasons, an average of 14 per year. His ERAs fluctuate, from a low of 2.45 to a high of 4.84, but twice after his cup of coffee with Pittsburgh he won 20 games with Springfield of the Eastern League. So what’s his story? Myrl Lincoln Brown was born on Oct. 10, 1894, in Waynesboro, Pa., a Cumberland Valley town near the Maryland border, about 20 miles west of Gettysburg and 64 miles southwest of Harrisburg. 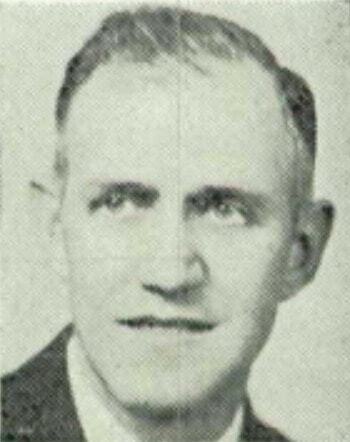 His father, Harry B. Brown, was a farmer and one-time employee in the machine shop of Frick Co., which made sawmills, steam engines, boilers and other agricultural machinery to support the local farming community. Myrl’s mother, Lizzie M. Brown, ran the home, which included a brother, Jacob, who was two years older, and twins George Hixon and Annie, five years younger than Myrl. Harry Brown died in December 1904 “after an illness of a month from asthma and heart trouble,” and Lizzie remarried. When Myrl filled out his World War I draft registation card in June 1917, he listed his occupation as a farmer on the farm of his stepfather, Clarence Brown, in nearby Greencastle, Pa. Eleven months later, Myrl was in the Army at Camp Greenleaf, Ga. He made corporal on July 5, 1918, and was married eight days later, as noted in the wonderful photo below, courtesy of Douglas Fuqua Sr. via Ancestry.com (click to enlarge). 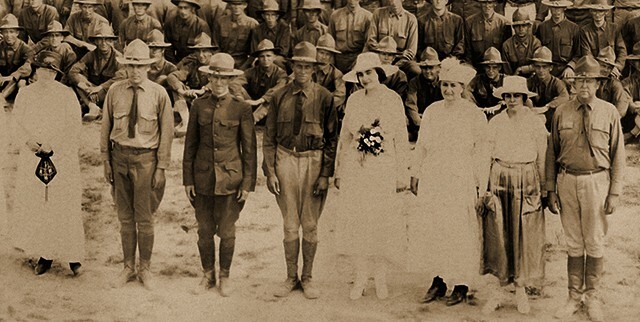 Myrl Brown’s wedding, July 13, 1918, Camp Greenleaf, Ga.
AND WEDDING OF CORP. MYRL BROWN. CAMP GREENLEAF, CHICKAMAUGA PARK, GA. JULY 13th 1918. Knowing that Myrl played professionally, it’s possible he participated in both the ballgame and the nuptials, perhaps with the game following the ceremony as a celebration. Myrl left the Army on April 7, 1919, and returned to Pennsylvania with his wife, the former Ethel Kathryn Harris. In 1920, they had a daughter, Myrl Gertrude, who went by Gertie. A son was born in 1926 but died eight days later. The cause on the death certificate is illegible, and the name is unclear, but it may have been William (though a Find a Grave memorial with the same date of death and cemetery shows no first name). The first record of his professional career I came across was in the Reading Eagle on July 27, 1919: “Terrific Hitting Give Orioles Double Victory,” the headline reads. “Birds get 20 blows off Brown in first game and 15 off Weinert and Bariess in nightcap.” The game was close for the first six innings, with Brown allowing two runs on five hits and his Reading mates responding with the same tallies. Baltimore broke through for three runs on four hits in the seventh, then put it out of reach with “a half score” on nine hits in the ninth. Brown went the distance, as pitchers often did then, allowing 13 runs on 20 hits in a 13-5 loss. He walked three, hit one batter and struck out three. Brown pitched for Reading for the better part of four seasons, compiling records of 18-21 in 1919, 13-22 in ’20, 17-14 in ’21 and 15-11 in ’22. Though complete-game records aren’t listed on Baseball-Reference, many of the articles I found in newspaper searches show Brown going the distance. In one game, on April 26, 1921, he replaced Dean Barnhardt in the fourth and “finished the contest in great form,” according to the Reading Eagle. In a 6-5 victory in 10 innings, Brown pitched 6 2/3 innings, allowing five hits and two walks, striking out two to earn the victory. Brown’s importance to the Aces appears again in August, when the Reading Eagle notes that “the locals have taken but three out of 18 games from Rochester, Myrl Brown twirling all three victories.” Three weeks earlier, he lobbied to start on just one day’s rest against Rochester after the Hustlers had “routed him from the box,” yielding four runs in the first three innings. In 1922, Reading — now managed by future Hall of Famer Chief Bender — improved by 15 wins, but that still meant only a 71-93 record and an improvement to sixth place from last in the eight-team circuit. Brown again led the team with 15 wins (against 11 losses), with Bender going 8-13 at the age of 38. But Brown’s ability was beginning to draw attention from the big leagues. Myrl Brown attained the peak of his pitching ambition in the International League on Monday afternoon, when he humbled the Baltimore champions over the shutout route in the first of a series of games at Lauer’s Park by the score of 3 to 0. … Maintaining his victorious stride that has several major league clubs interested, Brown turned in his second successive shutout victory within four days and has now chucked 18 innings without having been scored upon. … Brown was touched for eight swats, but they were scattered in all but the ninth inning, when the Orioles clustered three safe smashes, but were unable to cross the platter. … Several great fielding plays [helped Brown, who] fielded his position in great style, knocking down six hard drives and retiring as many batsmen at first. Brown allowed eight hits and struck out six, without walking anyone, against the Baltimore juggernaut that would go 115-62 in another championship season. By this time, the Pirates had a scout following Reading to watch Brown (Pittsburgh would evaluate him for two weeks, the Reading Eagle reported two years later in recapping his career arc) and the Brooklyn Robins were also interested. The pursuit by Major League clubs would reach a turning point on Aug. 3, when the St. Louis Cardinals came to Reading’s Lauer’s Park for an exhibition game. Cards manager Branch Rickey reportedly agreed to the game on the condition that Brown pitch against his club. Four days later, on Aug. 17, 1922, Reading reached an agreement with the Pittsburgh Pirates for Brown’s services. For $20,000 ($287,772 today) the Pirates got the Ace right-hander (and Brown himself received more than one-third, $7,500, of that money). It was said that Pirates owner Barney Dreyfuss called Reading to ask how much it would cost to acquire Brown, and in five minutes a deal was struck. Reading can now boast of having developed a new major league baseball find. Myrl L. Brown, star pitcher for the Reading International League club for the past four seasons, who was sold but three days ago by the local association to the Pittsburgh National League club, made an auspicious debut in the big show on Saturday when he twirled the Pirates to an 8 to 2 victory over the Boston Braves in the second game of a double-header. Brown, showing the same effectiveness that he flashed for Reading during the past several weeks, held the Braves to five hits. Prior to leaving the Aces last week, Brown won eight out of his last 10 starts on the mound for Chief Bender. Myrl Brown, the former Reading pitcher, making his first start for the Pirates and incidentally his major league debut, gave a masterly exhibition in the second game and let the Braves down with five scattered hits. After the sixth inning, when the Bostonese secured their final run, Brown was invincible. Brown joined the Pirates but yesterday, upon being sold by Reading to Pittsburgh for a price said to be around $20,000. The 27-year-old righty went the distance, allowing two runs on five hits, walking two and striking out three. Hall of Fame umpire Bill Klem worked the plate. But then during spring training in 1923, Brown’s arm “suddenly went dead from no accountable cause,” the Reading Eagle reported in February 1924. He was sent to Hot Spring, Ark., for treatment, “but the whip failed to respond.” The Pirates sent him to Dallas in the Texas League, but “after a fruitless week or two there he was freighted back to Pittsburgh. Next, he was turned over to a team in the Western League but the arm failed to revive there as well and again he was turned back as unwelcome. Finally, the Pirates sent him home and gave him unconditional release. The star of 1922 did not pitch three full games throughout the whole campaign of 1923.” Brown’s Baseball-Reference page does not even include a line for 1923, so either he never even reached the mound in a game, or evidence in the form of box scores or game accounts has yet to be uncovered. In the fall of ’23, Brown “launched a vigorous campaign of training with hopes of restoring the lost zip of his right arm. He made daily exhibitions into the woods and hills and virtually lived outdoors. On one of these trips, he slightly injured a leg but the member has completely healed. After several months of intensive exercising, Brown announced that his harm was again in good shape and he influenced [Cardinals scout] Pop Kelchner to give him another fling in the big show.” In February 1924, St. Louis signed Brown and brought him to spring training in Bradenton, Fla. It proved fruitless, however. Brown didn’t make the club and spent the 1924 season back in the International League, pitching for the Newark Bears and making frequent visits to Reading as a visitor. The Reading Eagle continued to report on Brown’s outings and his career, following the one-time local star as his pro pitching tenure played out. In 1925, Brown pitched again for Newark (which moved to Providence during the season) and then moved on to Springfield in the Eastern League, where he pitched in 1926 (20-9), ’27 (22-9) and ’28 (6-7) to wrap up his career. After his playing career ended, Brown became a teacher, first in the Philadelphia area, then in Harrisburg. Several yearbooks from Harrisburg’s William Penn High School show Brown as a teacher of biology and industrial science and coaching the baseball team, usually on an intramural level. His wife, Kathryn, died on March 4, 1964, of arteriosclerotic heart disease — coronary disease. Myrl lived nearly 17 more years, passing away on Feb. 23, 1981, in Harrisburg and is buried there in Paxtang Cemetery, alongside Kathryn and their son.